Sosumi Records recently launched, Kryder’s brand new record label with the aim of allowing previously unsigned artists to reach new audiences globally. The label will serve as a completely free outlet that will release underground music with unauthorized samples. 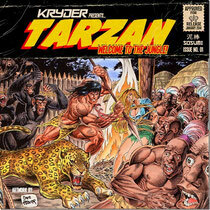 The first release on Sosumi is Kryder’s very own ‘Tarzan’ which debuted on his BBC Radio 1 mix and garnered support on Sunnery James and Ryan Marciano’s Essential Mix. This marks another step for the genre-crossing artist and the imprint will serve as an outlet for cool underground music containing unclear-able samples, these records often untouched by labels due to the many legalities involved. This inspired idea comes from the generation of vinyl loving "white label addicts" where highly exclusive music was driven from under the counters of record stores around the world. "I want to help new unsigned artists who like myself want to reach new audiences and gain the exposure they deserve. There is so much great music out there not getting what it should and I want to change that. I want to take the best original tracks that are held back and set them free, for free." Check out the first release, ‘Tarzan’, below.